Namco Bandai has joined forces with the creator of Homestuck to build a game in which players attend high school alongside a number of the publisher's iconic characters. 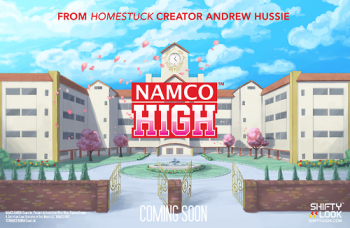 Namco High is a newly-revealed, HTML5-based browser game from Namco Bandai and Andrew Hussie, creator of the Internet-favorite latter day choose your own adventure story known as Homestuck. There's scant little known about Namco High beyond those two bits of information, but we can describe the game's premise: You're a high school student in a school populated by Namco Bandai characters. Heihachi might sit behind you in biology, and you might take Mr. Driller to homecoming. Is it silly? Absolutely, but who among you has never wanted to take an English class taught by the King of the Cosmos? Exactly. None of you. Namco High is currently slated for release in time for the 2013 holiday season. Hopefully Namco Bandai will be more forthcoming with details on the soon, as creating fictional scenarios of how this high school simulation could play out is making us really anxious for the final game.